Charles Ernest Franklin was born in West Ham, London on 12 November 1915, one of the seven children of Albert and May Franklin. He joined the RAF in 1940, and qualified as an observer. In April 1942, he was posted to 49 Squadron. Altogether, he flew on 28 operations in this squadron, some of the time with Bill Townsend but also with other pilots. 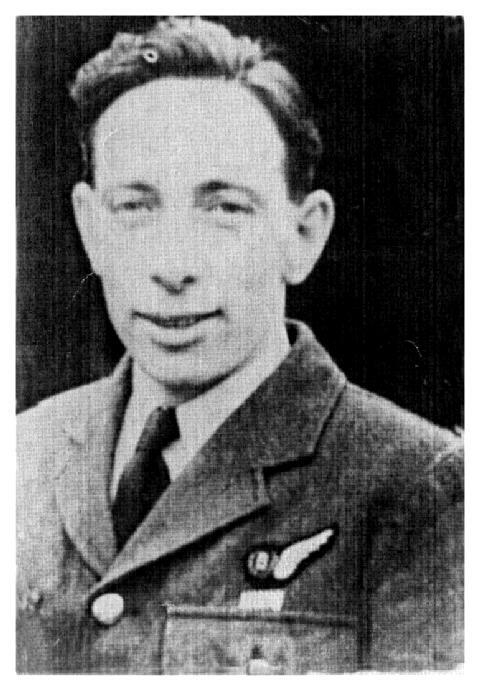 Unusually, he was recommended for the DFM before he had finished his first tour, with the citation noting his “marked singleness of purpose in his determination only to bomb the correct target, involving has it frequently has done several runs to identify it positively before releasing his bombs.” The award of the medal came through two days after the Dams Raid itself. In March 1943, Franklin was offered the chance to transfer to 617 Squadron with the rest of Townsend’s crew. He took his place in the bomb aimer’s compartment on the raid, but had to wait until the crew reached the Ennepe Dam sometime after 0300. His job was made much more difficult as a result of the violent shudder caused by the rotating mine, with the result that it took him three dummy runs before he got the line and distance correct. His fourth attempt was successful, and the Upkeep was dropped at 0337. The dam, however, was not breached. Despite this, Franklin was commended for his efforts and received a Bar to his just-acquired DFM for his work on the night. Only 60 Bars to the DFM were awarded during the whole war, and Franklin’s was the only one given to a 617 Squadron airman. He travelled to Buckingham Palace to receive it, and was photographed outside with Bill Townsend and four of the rest of the crew. The Dams Raid was Franklin’s first and last operation in 617 Squadron. In July he was posted on a bomb aimer’s instructors course and then at the end of August 1943, he went to a conversion unit as an instructor. During this time, he was commissioned. He returned to operations in July 1944 with 83 Squadron. He flew on a handful of operations with Flt Lt J Meggeson, but was then taken sick and did not complete this tour. After the war, Franklin moved to Birmingham and set up a successful catering business with his parents. There was a flurry of publicity about him in 1955 when his name was omitted from the initial guest list for the Royal Premiere of the film The Dam Busters, but this was rectified in time and he was able to attend. He died on 25 January 1975, and his funeral was attended by a number of his ex-crewmates. It was widely covered in the press, and a series of photographs taken for the Daily Mirror can be seen in agency archives. Survived war. Died 25 January 1975. Another great write up Charles , would I be correct in saying that Charles and his wife got an invite to the repeat premier on May 17th and not the premier on the 16th . as a young lad I met Charles, He worked for my Father at Belgrave grinding in Birmingham. He was a quite man who rarely talked about the war. He lived in a bedsit near our home. Charles was a heavy drinker and I remember my Father asking my to check on him as he had not turned up for work. His electric shaver had blown up on his face. Charles never had any visitors and seemed a very lonely man. In respect of his commitment to our country I remember him and honour him and all others each remembrance day.